fantasy of violet on the small island. the silk inside of my Grandma’s purse. before the band awoke, grumbling. Riley’s father had a gig on Block Island, just off the coast of Rhode Island. I skipped a lot of the performances, preferring to sit on a rocker on the front porch and talk to our hostess about our baby to be. We’d watch as an elbow or foot almost punched through my thin summer dress, chatting. We spoke of the bushes, and violet was the choice of everyone on her block. In Alice Walker’s novel, The Color Purple, the character Shug declared, “I think it pisses God off if you walk by the color purple in a field somewhere and don’t notice it.” I think she was onto something. This is written in such a lovely way. I don’t understand and hope I’m not being insensitive. Is Violet a living child? It feels like your only memory of her was that walk and the hydrangeas. You spoke of them dying. If so, such a wonderful loving tribute. Amy!! This is so softly colored and contains so much fullness of color and potential and love…mama love…so rich and so timely being mother’s day tomorrow, a very happy one to you, Amy! Thank you for bringing that quote as well, I agree. This moves so beautifully, Amy! Oh this is gorgeous, a glimpse of that time in your life, the pregnancy, the hydrangeas……one glorious feast of blooms. I can see you, ponderous and happy with child. I can see those hydrangeas, too. The use of enjambment at stanza’s beginnings and ends effectively carries the reader through the tale at a quick-step pace. Beautiful imagery, Sweet Amy! A wonderful memory brought to life again. Happy Mother’s Day. This is very moving, Amy. A wonderful memory recalled. here at net, except I know I am getting experience everyday by reading such fastidious content. I love both the “passing of things” feel and the specific detail. Reads of a real place, a real time and a moving (on) experience. Great stuff. 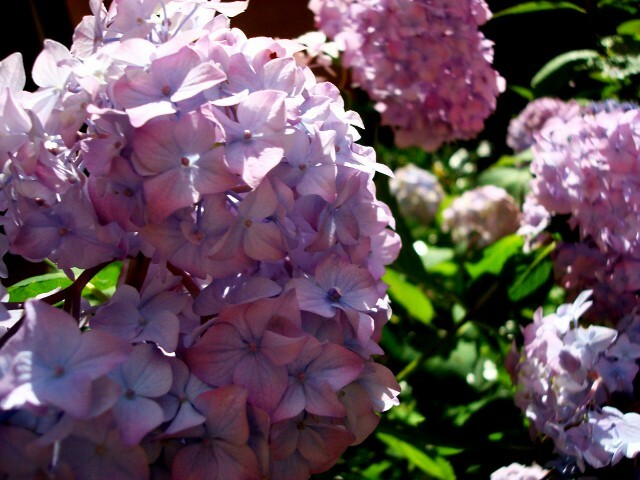 I’m a sucker for flower images, but many are awfully trite–yours here of the hydrangeas and your grandmother’s purse, and the context you put it in is just really cool, Amy. I enjoyed this very much. I love it when your poetry reflects real life … beautiful write. Oh, how wonderful, you and the hydrangea, both in full bloom. A beautiful response to the violet prompt, Amy. I love it. ‘inside of grandma’s purse’ beautiful description of the fading flower. Of course, being me, I would like it to stay purple forever.